It’s a Doughnut! It’s a Danish! It’s a Doughnish! This exciting new product has just landed on South African shores and will be available in all Krispy Kreme stores from the 7th of January to the 31st of January 2018! 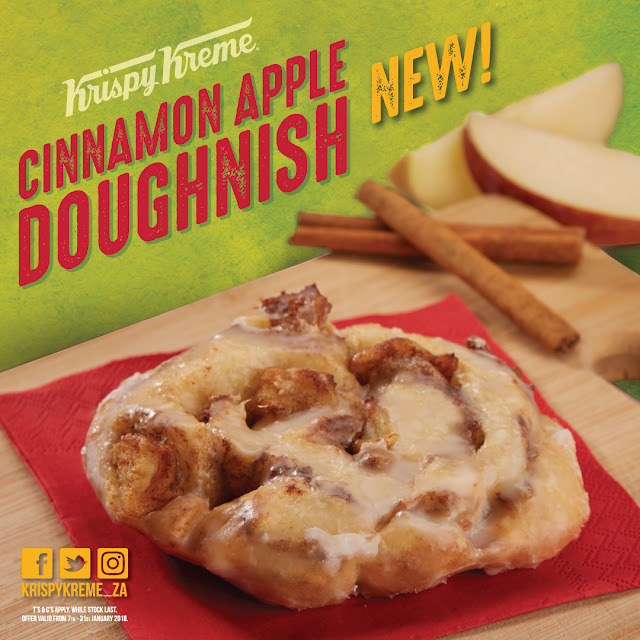 The Doughnish will be available in one delicious flavour (for now) -Apple and Cinnamon. The Doughnish is a combination of the secret dough mix plaited with apples and sautéed in a light syrup and finished with cinnamon. That’s not all in exciting news for Krispy Kreme this January. Krispy Kreme will be relaunching their Frozen Lemonade range which includes 6 refreshing flavours, that will keep you cool this summer. Watermelon, Kiwi, Classic Lemonade, Mixed Berries, Mango and Green Apple. For those fans that missed them the first time; Krispy Kreme South Africa will also be featuring 3 of the best doughnuts from 2017. Banoffee Pie, Chocolate Hazelnut Kreme and the Glazed Lemon Filled. These delicious treats will be available for the month of January.